Before importing and/or adding patrons be sure to set up your patron categories. Patrons are added by going to the ‘Patrons’ module. Once there you can add a new patron. 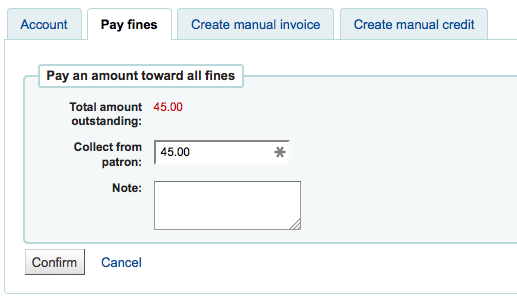 The fields that appear on the patron add form can be controlled by editing the BorrowerUnwantedField system preference. If you’d like to prevent full names from printing on slips and you’re not using the Initials or Other name fields for anything else, you can use them for shortened versions of the name to then be printed on the slip. Then on the slip you can have it print the <<borrowers.initials>> instead of the full name (NCE). Then on the slip you can have it print the <<borrowers.initials>>, <<borrowers.firstname>> instead of the full name (E, Nicole). For contact information, note that the primary phone and email addresses are the ones that appear on notices and slips printed during circulation (receipts, transfer slips and hold slips). The primary email is also the one that overdue notices and other messages go to. An alternate contact could be a parent or guardian. It can also be used in academic settings to store the patron’s home address. For a newly installed system this preference will start at 1 and increment by 1 each time after. To have it start with the starting number of your barcodes, enter the first barcode by hand in the patron record and save the patron. After that the field will increment that number by 1. ‘Check for previous checkouts’ is used to set the patron’s personal preference regarding checking their circulation history to see if they have borrowed this item in the past. This overrides the setting of the patron category and of the CheckPrevCheckout system preference. The Staff/OPAC asks for the username and password to be used by the patron (and/or staff member) to log into their account in the OPAC and for staff to log in to the staff client. Staff will only be able to use this log in info to log in to the staff client if they have the necessary permissions. Finally, if you have EnhancedMessagingPreferences set to ‘allow,’ you can choose the messaging preferences for this patron. Patrons can choose to receive their notices as a digest by checking the ‘Digest only?’ box along with the delivery method. A digest is a combination of all the messages of that type (so all items due in 3 days in one email) in to one email instead of multiple emails for each alert. If the system suspects this patron is a duplicate of another it will warn you. A duplicate patron is detected if first and last names match and there is no date of birth populated or if first name, last name and date of birth fields are all populated. If two patrons have matching names, but one has a date of birth and the other does not they will not match as duplicates. 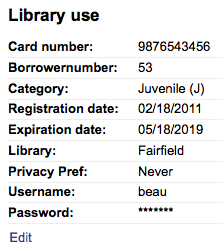 If your circulation desk is very busy and you want to register patron quickly, you can use the ‘quick add’ feature. It’s a shortened version of the add patron form with only a couple of necessary fields to fill out. This feature uses two system preferences: BorrowerMandatoryField and PatronQuickAddFields. 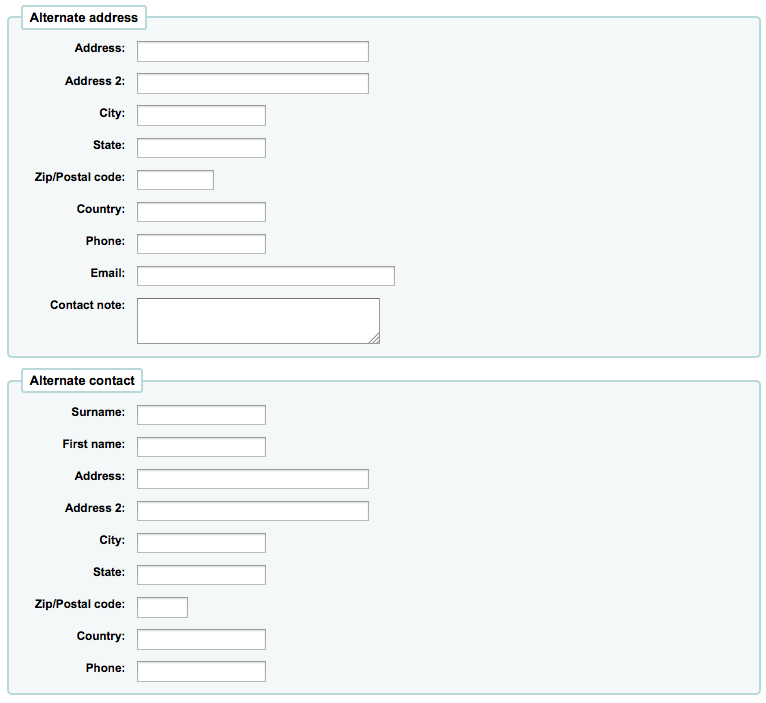 These are the two system preferences that control which fields are in the quick add form. Click on the ‘Quick add new patron’ button. You will be asked to choose a patron category. Then, you will be presented with a shortened form. Once the form is filled out, click on ‘Save’. If you need to access the full form, you can click on ‘Show full form’ above the ‘Save’ button. Remember to assign your staff secure usernames and passwords since these will be used to log into the staff client. 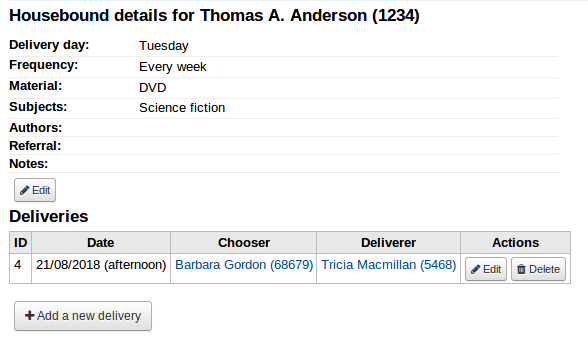 One way to track use of in house items is to “check out” the materials to a statistical patron. 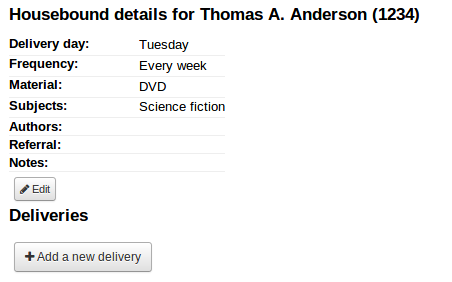 The “check out” process doesn’t check the book out, but instead tracks an in house use of the item. To use this method for tracking in house use you first will need a patron category set up for your statistical patron. Next, you will need to create a new patron of the statistical type. Next, follow the steps put forth in the ‘Add a new patron’ section of this manual. 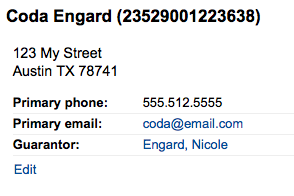 Since this patron is not a real person, simply fill in the required fields, the correct library and nothing else. To learn about other methods of tracking in house use visit the tracking inhouse use section of this manual. 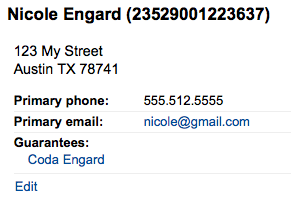 Sometimes when you’re adding a new family to your system you don’t want to type the contact information over and over. Koha allows for you to duplicate a patron and change only the parts you want to (or need to) change. If you would like you can add patron images to help identify patrons. To enable this feature you must first set the patronimages preference to ‘Allow’. If the preference is set to ‘Allow’ you will see a placeholder image under the patron’s name and box to upload a patron image below the basic contact information. In the ‘Upload patron image’ box click ‘Browse’ to find the image on your computer and ‘Upload’ to load the image on to the patron record. Patrons in Koha can be edited using one of many edit buttons. 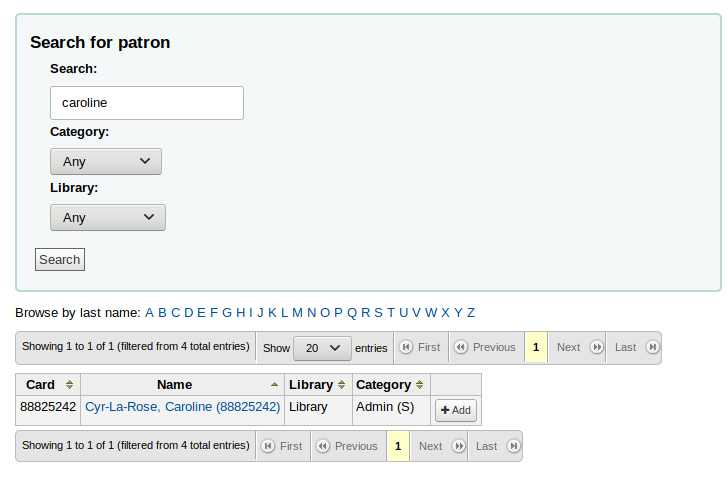 To edit the entire patron record simply click the ‘Edit’ button at the top of the patron record. Patron passwords are not recoverable. The stars show on the patron detail next to the password label are always there even if a password isn’t set. If a patron forgets their password the only option is to reset their password. To change the patron’s password, click the ‘Change password’ button. Koha cannot display existing passwords as they are encrypted in the database. Leave the field blank to leave password unchanged. 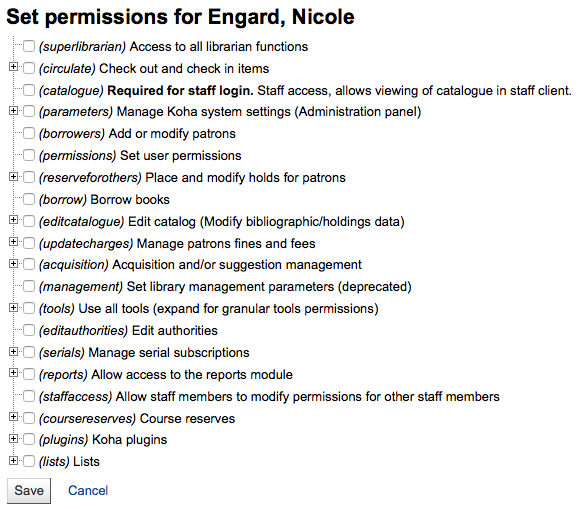 To edit a specific section of the patron record (for example the ‘Library use’ section) click the ‘Edit’ link below the section. A patron image can be added by browsing for the image on your machine from the ‘Manage patron image’ section. 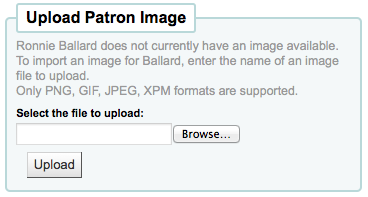 This form will not appear if you have the patronimages system preference to not allow patron images. 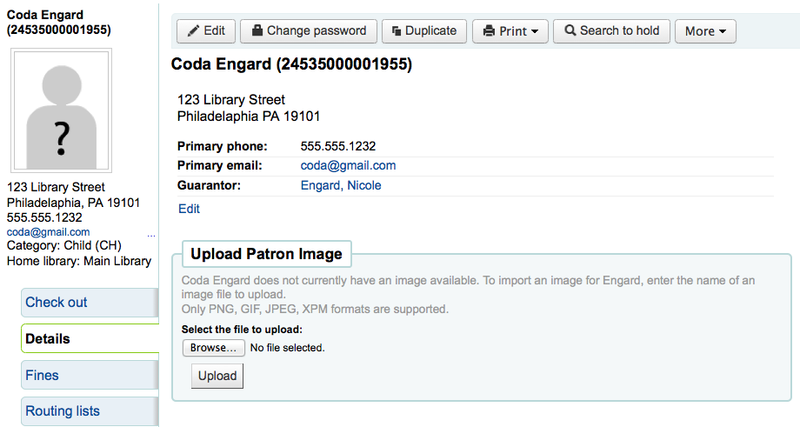 To add patron images in bulk, use the Upload patron images tool. 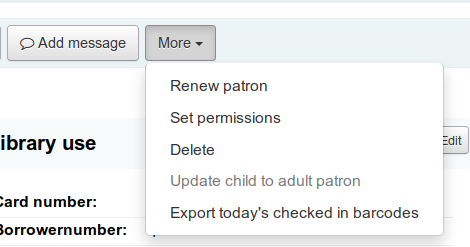 When renewing a patron account you can either edit the the expiry date manually in the patron record or use the ‘Renew patron’ option from the More menu in the toolbar at the top. Using the latter the new expiry date will be calculated using the enrollment period configured for the patron category of the user. The system preference BorrowerRenewalPeriodBase determines if the new expiry date will be calculated from the current date or from the old expiry date. One advantage of using the ‘Renew patron’ option is that it will be logged as a membership renewal in the action_logs table and be visible as such when using the Log viewer or the Modificaton log from the patron account. The renewal date of the patron account will be visible on the details tab. If you are allowing patrons to edit their accounts via the OPAC with the OPACPatronDetails preference then you will need to approve all changes via the staff client before they’re applied. If there are patron edits awaiting action they will appear on the staff client dashboard below the modules list (along with other items awaiting action). Superlibrarians will see modifications for any branch, other staff will only see modifications for patrons who belong to their logged in branch. When you click the ‘Patrons requesting modifications’ link you will be brought to a list of patrons with requested changes. From here you can ‘Approve’ and apply the changes to the patron record, ‘Delete’ and remove the changes or ‘Ignore’ and keep the changes pending to review later. 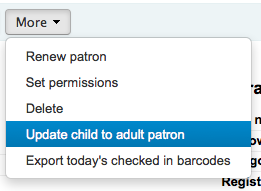 If you would like to see the entire patron record you can click the ‘Patron details’ links to the right of the buttons. This will open in a new tab. If you accidentally end up with one patron with two cards it is possible to merge their records together so that you don’t lose their loan history or holds. In the patron list, check the boxes next to the records you want to merge and click on the ‘Merge selected patrons’ button. It is possible to merge more than two records at a time. Select the patron record you want to keep and click on the ‘Merge patrons’ button. 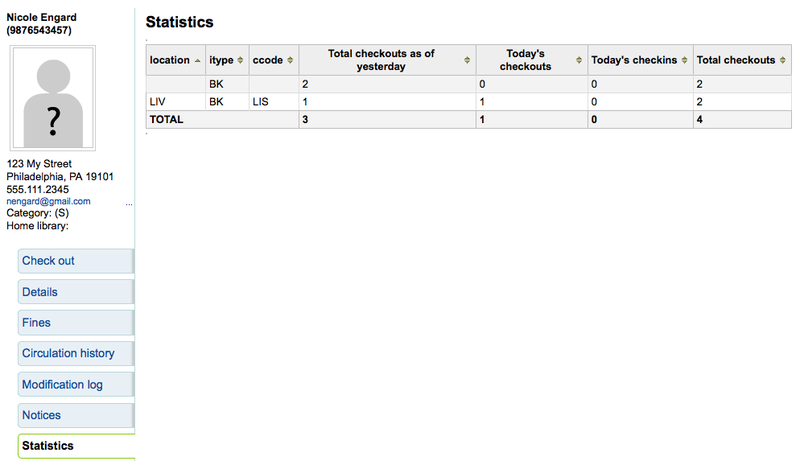 The checkouts and statistics will be transferred to the right record and the other one will be deleted. Patron permissions are used to allow staff members access to the staff client. In order for a staff member to log into the staff interface they must have (at the very least) ‘catalogue’ permissions which allow them to view the staff interface. You will be presented with a list of preferences, some of which can be expanded by clicking the plus sign to the left of the section title. All staff have permission to create and modify their own lists, this permission is only necessary if you’d like to give a staff member permission to delete public lists that they have not created. The ability to access the Audio alerts configuration in the administration module. The ability to access the Auhorized values configuration in the administration module. 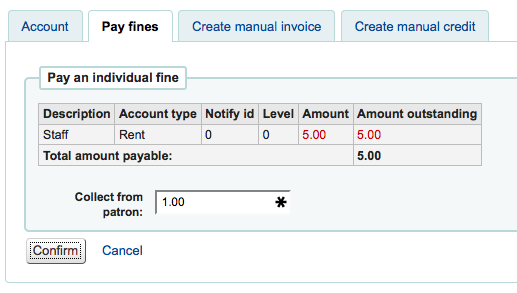 The ability to access the Circulation and fines rules configuration in the administration module. Manage circulation rules form any library. 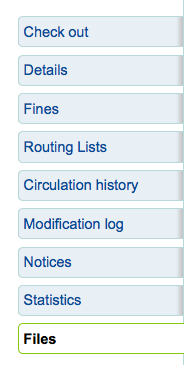 If not set the logged in user can only edit circulation rules from their own library (please note that manage_circ_rules is still required). The ability to access the Cities and towns configuration in the administration module. The ability to access the Classification sources configuration in the administration module. The ability the access the Configure columns page in the administration module. The ability to access the Did you mean? configuration in the administration module. The ability to access the Item circulation alerts configuration in the administration module. The ability to access the Item search fields configuration in the administration module. The ability to access the Item types configuration in the administratoin module. The ability to access the Keywords to MARC mapping configuration in the administration module. The ability to access the Libraries and Library groups configuration pages in the administration module. The ability to access the MARC bibliographic framework, Authority types, Koha to MARC mapping configuration areas in the administration module. The ability to access the Record matching rules configuration in the administration module. The ability to access the OAI sets configuration in the administration module. 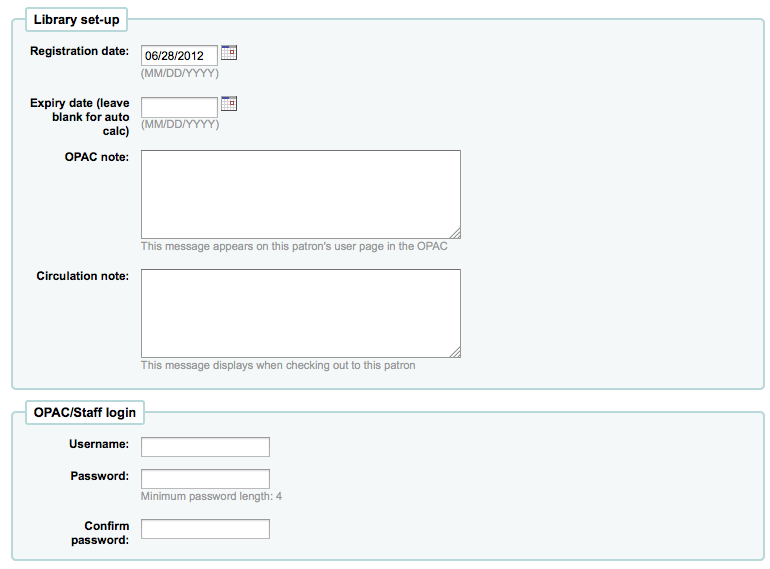 The ability to access the Patron attribute types configuration in the administration module. The ability to access the Patron categories configuration in the administration module. The ability to access the Search engine configuraton in the administration module. Note: This area will only be visible when the SearchEngine system preference is set to ‘Elasticsearch’. The ability to access the Z39.50/SRU servers configuration in the administration module. The ability to access the SMS cellular providers configuration in the administration module. Note: This area will only be visible when the SMSSendDriver system preference is set to ‘Email’. The ability to access the Global system preferences in the administration module. The ability to access the Library transfer limits and Transport cost matrix configuration pages in the administration module. Ability to access the Share your usage statistics configuration in the administration module. The ability to access all remaining areas in the administration module. View patron infos from any libraries. If not set the logged in user could only access patron infos from its own library or group of libraries. The ability to access the Currencies and exchange rates configuration page. Note: Vendors are used in the acquisition and the serials module. All staff members have permission to access lists. This section only needs to be checked off if you want to give permission to a staff member to delete public lists that they have no created themselves. Log into the self check-in module. Perform self checkout at the OPAC. For instruction on checking items out, view the Checking out section of this manual. All patron information will appear in the Details tab. 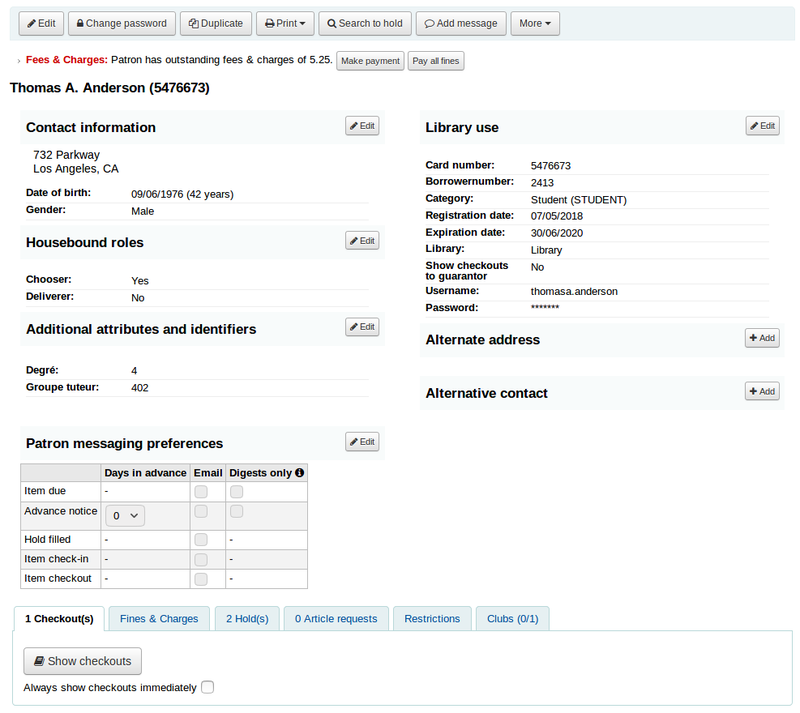 This includes all the contact information, notes, custom patron attributes, messaging preferences, etc. entered when adding the patron. In the case of patrons who are marked as ‘Child’ or ‘Professional’ and their guarantors additional information will appear on their record. Below the patron’s information on the details screen is a tabbed display of the items they have checked out, overdue, and on hold. The first tab shows the items the patron currently has checked out. If they have family at the library, staff can see what the other family members have checked out. The Fines & charges tab will show for all patrons, even those who don’t owe anything. 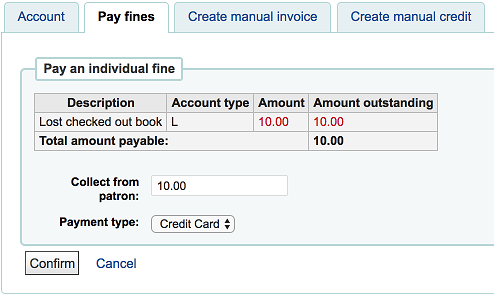 If the patron does owe money to the library, the tab will show the total amount, without any details. To see the details, go to the fines tabs. If the patron has holds, the number of holds will appear on this tab’s title and the details will appear in the tab. The barcode and call number will only appear on item-level holds or holds that have been confirmed. Record-level holds that are not waiting to be picked up will not have barocdes or call numbers. 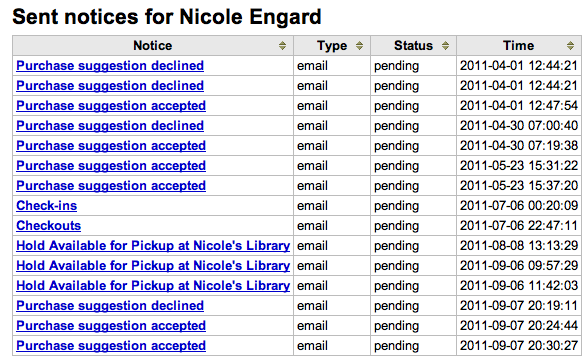 From here you can manage the patron’s holds: change the pickup library, cancel or suspend holds. You will only be able to suspend holds if the SuspendHoldsIntranet system preference is set to “Allow”. If, when suspending a hold, you want to be able to set a date at which to automatically resume the hold, set the AutoResumeSuspendedHolds system preference to “Allow” and make sure the unsuspend_holds cron job is activated. If the ArticleRequests system preference is enabled, and the circulation rules allow it, the patrons will be able to request articles, either through the OPAC or in the staff interface. The details of the patron’s request, and its status, are visible in this tab. The Restrictions tab will show for all patrons. If the patron has no restrictions you will see that on the tab. If the patron has restrictions on their account the tab will show the number and the description. 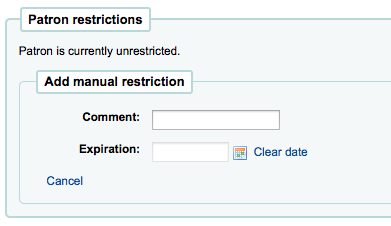 Using the ‘Add manual restriction’ button you can add a restriction to the patron record from here. This can be used for any type of restriction you need to put manually on a patron record. The overdues restrictions are automatically set when overdue notices are sent if you specified you wanted the patron restricted in the Overdue notice/status triggers tool. This restriction will not be removed automatically when the overdue items are returned unless the AutoRemoveOverduesRestrictions system preference is set to ‘Do’. In the circulation rules, you can choose to fine users by suspending them instead of (or in addition to) fining them money. In that case, returning an overdue document will trigger a suspension restriction. Patrons may also be restricted if you have issued a discharge for them. 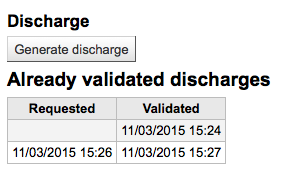 Once the discharge is validated, the patron is automatically restricted. 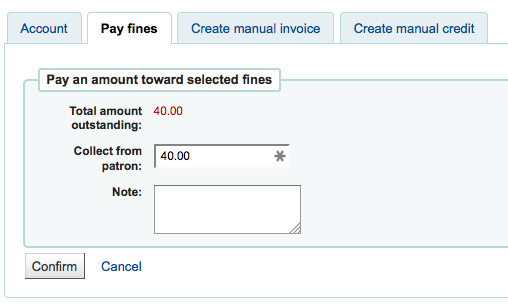 Restrictions on a patron record will block checkouts. In fact, a message will appear in red when going to the checkout page. 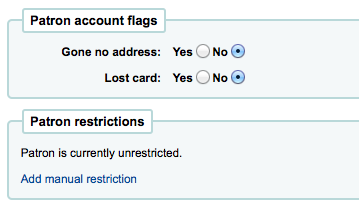 Restrictions may also prevent renewing items if the RestrictionBlockRenewing system preference is set to ‘block’. On the OPAC, patrons will get a message saying their account is frozen. They will not be able to place holds from the OPAC. If you have patrons that have more than one restriction, you can choose to cumulate their restriction periods or not through the CumulativeRestrictionPeriods system preference. Set the OverduesBlockCirc system preference to ‘Block’ to prevent patrons who have overdue materials from checking out other materials. Set the OverduesBlockRenewing system preference to ‘block renewing for all the patron’s items’ or ‘block renewing only for this item’ to prevent patrons who have overdue materials from renewing their loans. Enter values in the noissuescharge and NoIssuesChargeGuarantees system preferences in order to block checking out to patrons who have more than a certain amount in fines or to patrons whose guarantees owe more than a certain amount. Enter a value in the maxoutstanding system preference to prevent patron from placing holds on the OPAC if they owe more than a certain amount. Enter a value in the OPACFineNoRenewals system preference to prevent patron who owe more than a certain amount to renew their loans from the OPAC. Set the BlockExpiredPatronOpacActions system preference to ‘Block’ if you want to prevent patron whose membership has expired to place hold or renew their loans from the OPAC. If you use patron clubs, patrons will have a tab in their record indicating which club they are enrolled in, if any. The patron’s complete accounting history will appear on the Fines tab. Contrary to its name, the Fines tab does not just show fine data, it also shows membership fees, rental fees, reserve fees and any other charge you may have for patrons. At the top of the table you can click the ‘Filter paid transaction’ to hide all completed transaction and above that you can use the search box to find a specific charge or payment. 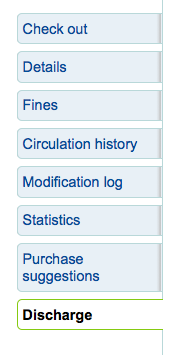 Each line item can be paid in full (or written off) using the ‘Pay fines’ tab. Each line item can be paid in full, partially paid, or written off. The fine will be removed from outstanding fines, and displayed as fully paid. The fine totals will be updated with the payment applied to oldest fines first. Enter an amount to pay towards the fines. The fine totals will be updated with the payment applied to the oldest selected fines first. Click “Writeoff” next to the fine you wish to writeoff. A confirmation box will appear to specify a total amount to writeoff. This box allows a partial writeoff of fines. The fine will be removed from outstanding fines, and displayed as written off. 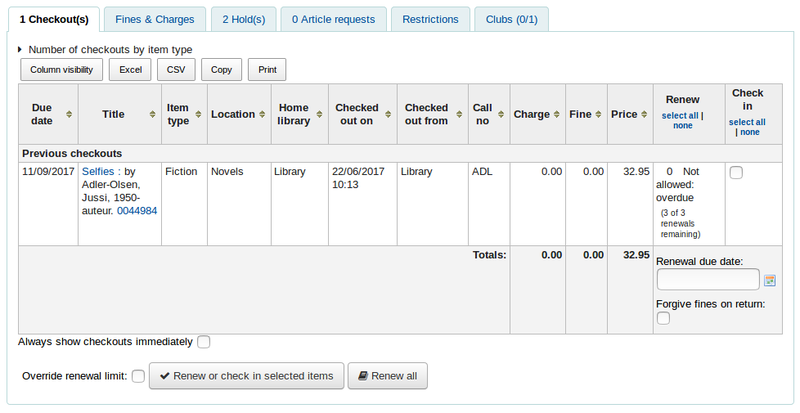 Check the selection boxes next to the fines you wish to pay, click “Writeoff selected”. All fines will be removed from outstanding fines, and displayed as written off. 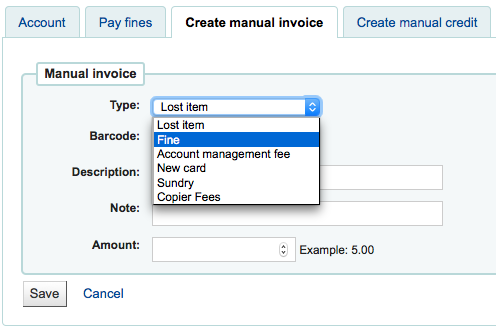 You can enable email receipts for payment and writeoff transactions with the UseEmailReceipts system preference. The value set as the authorized value for the MANUAL_INV authorized value category will appear as the description and the authorized value description will be used as the amount. 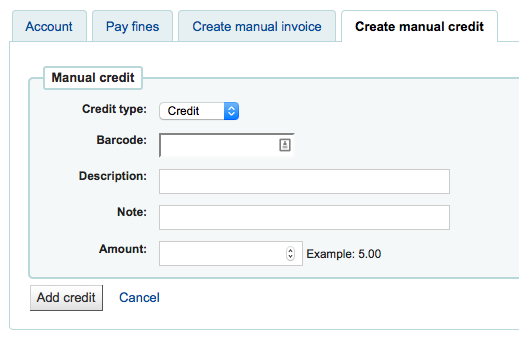 Manual credits can be used to pay off parts of fines, or to forgive a fine amount. To the right of each account line there is a print link. Clicking that link will print an invoice for the line item that includes the date and description of the line item along with the total outstanding on the account. 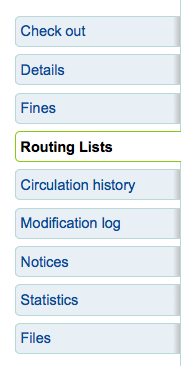 A list of all of the serial routing lists the patron belongs to will be accessible via the ‘Routing lists’ tab on the patron record. On this tab you will be able to see and edit all of the routing lists that this patron is on. The circulation history tab will appear if you have set the intranetreadinghistory preference to allow it to appear. If you have the OPACPrivacy system preference set to ‘Allow’ and the patron has decided that the library cannot keep this information this tab will only show currently checked out items. If you would like to export a list of barcodes for the items checked in today you can find that option under the More menu on the top right of the page. This will generate a text file with one barcode per line. 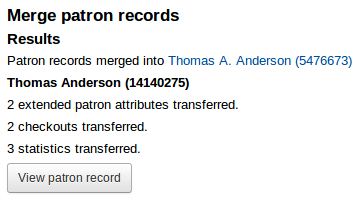 If you have set your BorrowersLog to track changes to patron records, then this tab will appear. The Modification log will show when changes were made to the patron record. If you also have turned on the IssueLog and ReturnLog you will see checkins and outs on this screen as well. Clicking on the message title will expand the view to show you the full text of the message that was sent. If the message has a status of sent or failed you will have the option to ‘resend’ the message to the patron by clicking the ‘resend’ button found under the status. Depending on what you set for the values of your StatisticsFields system preference, you can see statistics for one patron’s circulation actions. If you set the EnableBorrowerFiles preference to ‘Do’ the Files tab will be visible on the patron information page. From here you can upload files to attach to the patron record. All files that are uploaded will appear above a form where additional files can be uploaded from. 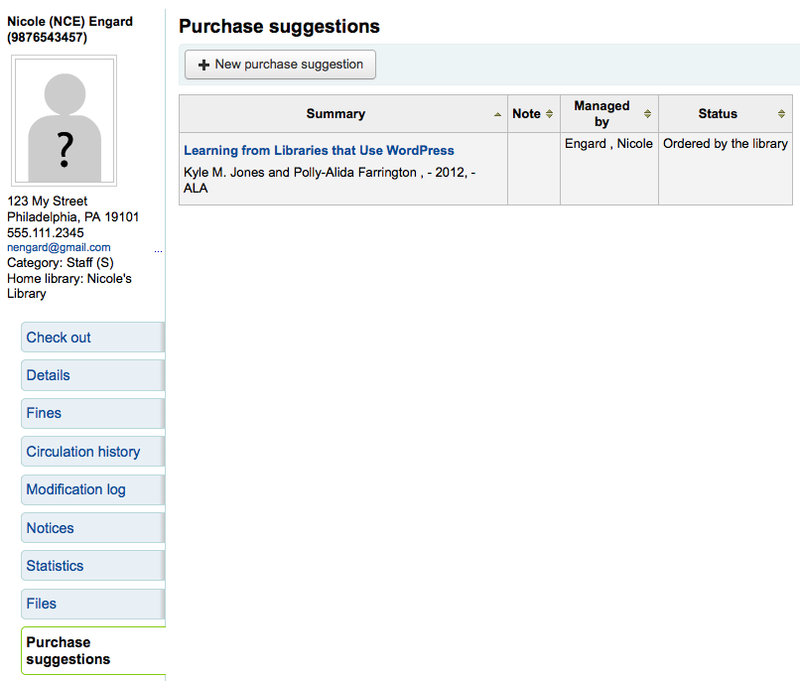 If the patron has made any purchase suggestions you will see a purchase suggestions tab on the patron record. From here you can see all suggestions made by the patron and their status, you can also create a purchase suggestion on the patron’s behalf by clicking the ‘New purchase suggestion’ button at the top. Learn more about purchase suggestions in the Acquisitions chapter of this manual. A discharge is a certificate that says the patron has no current checkouts, no holds and owe no money. 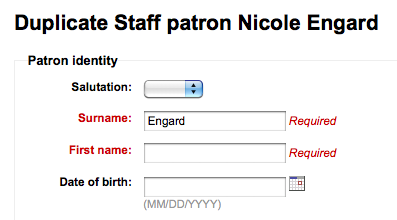 To enable this opti`on on the patron record you need to set the useDischarge system preference to ‘Allow’. In France a “quitus” (“discharge”) is needed if you want to register for an account in a library or a university. Academic libraries often require that you have a clear record at the library before you can graduate. If not then you’ll see an error explaining why you can’t discharge the patron. You can style the PDF using the NoticeCSS preference. There are three roles a patron can have in regard to housebound circulation: borrower, chooser or deliverer. In order to use the housebound module, the HouseboundModule and ExtendedPatronAttributes system preferences must be enabled. If you have enabled the housebound module, with the HouseboundModule system preference, you will see that patrons now have a new section in their record called ‘Housebound roles’. Click the ‘Add’ button to mark this patron as a ‘Chooser’. The chooser is in charge of choosing the materials for the housebound patron. 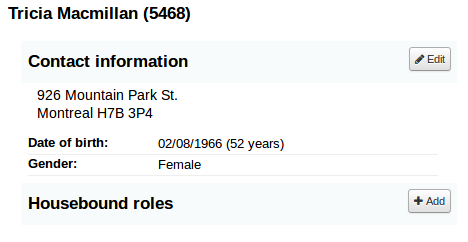 In the ‘Housebound roles’, click the ‘Add’ button to mark this patron as a ‘Deliverer’. The deliverer is in charge of delivering the chosen materials to the housebound patron on a specific day at a specific time. 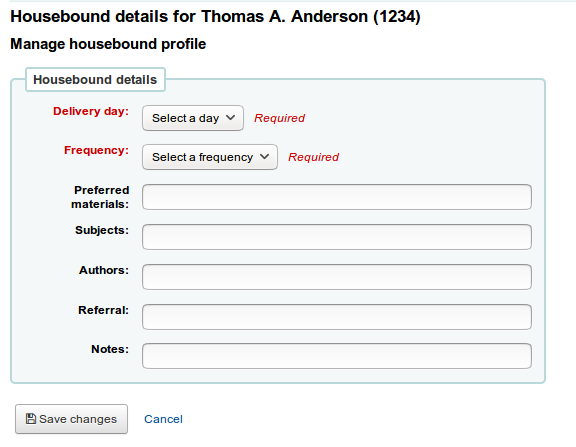 To create a housebound profile for an housebound patron, click on the ‘Housebound’ tab in their record. 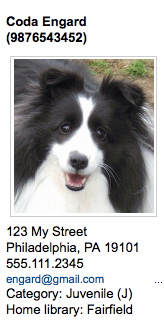 From there, you can edit their housebound profile information. Delivery day: choose which day (or ‘Any’) the patron prefers to receive their delivery. Frequency: choose the frequency at which they want to receive their deliveries. The frequencies are managed through the HSBND_FREQ list of authorized values. Preferred materials: enter notes that will help the chooser choose appropriate documents for the housebound patron. For example: books, dvds, magazines, etc. Subjects: if the housebound patron has a preference for particular subjects, enter it here. This will help the chooser choose interesting documents for the patron. For example: romance, cookbooks, thrillers, etc. Authors: if the housebound patron has favorite authors, enter them here. For example: Danielle Steel, James Patterson, etc. Referral: if the housebound patron has a referral, enter it here. Notes: enter any other notes that may help the chooser or the deliverer. Click the ‘Save changes’ button to save the housebound profile. To plan visits, go to the housebound patron’s record. In their housebound tab, you will be able to create deliveries. Click on ‘Add a new delivery’. Date: Enter the date of the delivery. Time: Select a time of day for the delivery. The choices are morning, afternoon, or evening. Chooser: Select a chooser who will be in charge of selecting the materials for this housebound patron. Deliverer: Select a deliverer who will be in charge of picking up the materials and bringing them over to the housebound patron. 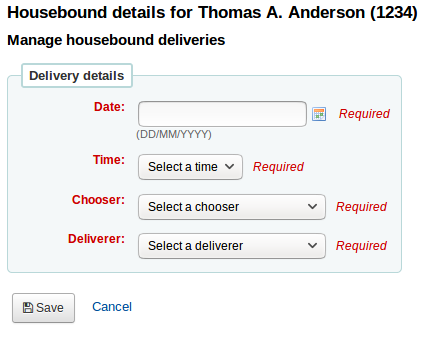 Choosers and Deliverers can be notified of planned deliveries via reports. Example reports be found in the SQL Reports Library at https://wiki.koha-community.org/wiki/SQL_Reports_Patrons#Patron_Characteristics. Clicking the small plus sign [+] to the right of the search box will open up an advanced patron search with more filters including the ability to limit to a specific category and/or library. You can also filter your patron results using the search options on the left hand side of the page. Depending on what you have chosen for the ‘Search fields’ you can search for patrons in various different ways. Enter the phone number exactly as it is in the system or by using spaces between each batch of numbers. Birth dates should be entered using the format set forth in the dateformat preference. 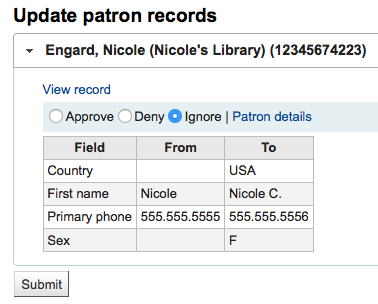 This is a custom field that libraries can use for any type of data about the patron. 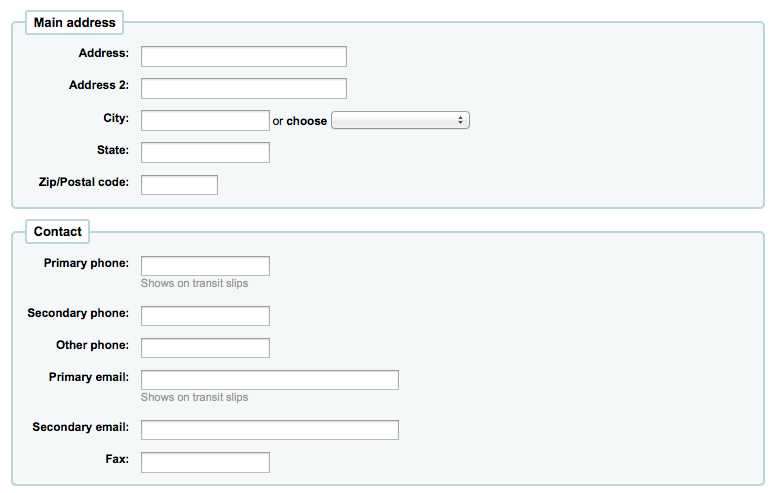 You can also choose to either search for fields that start with the string you entered or contain the string. Choosing ‘Contains’ will work like a wildcard search. You can also browse through the patron records by clicking on the linked letters across the top.